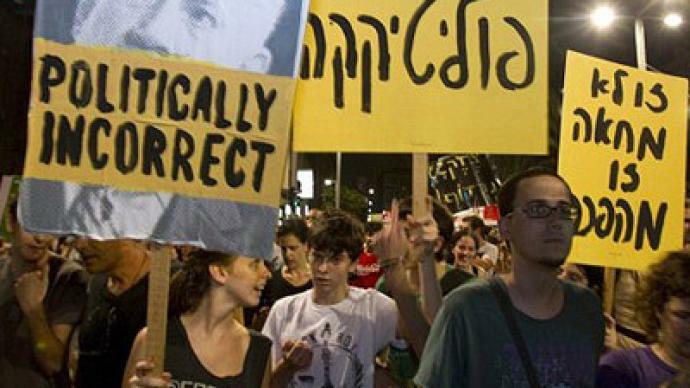 Hundreds of thousands of anti-government protesters have taken to the streets of Israeli cities demanding “social justice.” The rally has already been called the largest in the history of the Jewish state. 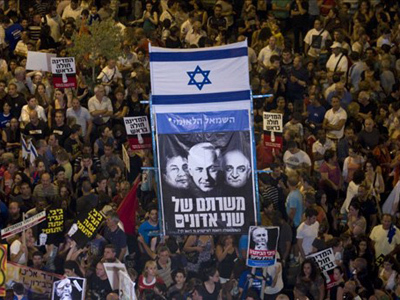 ­According to local media, more than 400,000 Israelis took to the streets in cities across the country on Saturday night. More than 300,000 are said to be protesting in Tel Aviv near the Israeli Prime Minister Benjamin Netanyahu's residence, and more than 100,000 demonstrated elsewhere, particularly in Haifa and Jerusalem. The estimated figures were record breaking, exceeding even the 300,000 people who took part in similar demonstration on August 6. Organizers have been dubbing the rally the “Million Man March,” hoping that 1 million people will turn out on the streets of Israel. There have not been any reports from the police yet. Many Israelis are angry with living costs and the government's handling of social issues, including education and health care. People say it is simply too expensive to live in Israel. 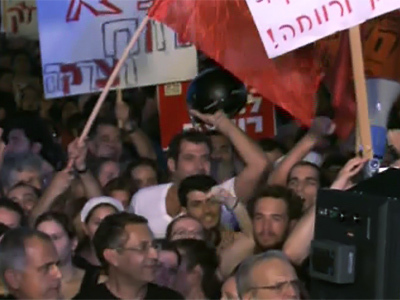 The protestors want Prime Minister Netanyahu to enact economic reforms. A committee to examine the call for reforms has been formed, but the prime minister has warned he cannot meet all the protesters' demands. 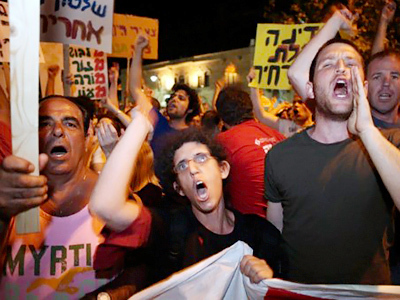 The most recent demonstration marked the eighth week in a row of protests around Israel. The “Million Man March" movement began in mid-July when some angry Israelis set up protest tents in Tel Aviv and other cities across the country. Gershon Baskin, Israeli-Palestinian conflict analyst, says the social unrest amongst Israel’s middle class is a strong sign that the country is heading in the wrong direction. Instead of financing settlements in the occupied territories to the tune of billions of dollars, Israel should be spending the cash on domestic construction and social programs. “The gaps between rich and poor in Israel have grown. It has gone from a society that 30 years ago was one of the most egalitarian in the world, to having the second widest gap between rich and poor only after the US,” Baskin told RT. “We have a problem of increasing privatizational philosophy that our Prime Minister adheres to. And what we’ve seen privatized in Israel over the past years are social services which should be provided by the government. “We heard a lot of voices in Israel when asking the protesters and those who are leading them – where should the money come from to pay for all these social services and to close the gaps? Two answers come quite often: one – take money away from the very high military budget and the other is to transfer money which is going to the settlements in the occupied territories to building inside of the country proper,” he added. ­Yehudit Oppenheimer, executive director of Ir Amim, an Israeli NGO, believes the anti-government rallies mark a remarkable moment in the history of Israel, because “even in a time of political tensions and terror attacks,” people still take to the streets to demand social justice. “I think people have seen a government that creates no hope,” she said.